[133 Pages Report] The overall biometric vehicle access system market is expected to grow from USD 0.44 billion in 2016 to USD 0.85 billion by 2021, at a CAGR of 14.06% from 2016 to 2021. The market for fingerprint recognition system is at the growth stage, whereas the voice recognition system market is recently introduced and a slowly growing market. A fingerprint recognition system is a device that thwarts any unauthorized entry into the vehicle unless the correct fingerprint of the driver is provided. This advanced technology is expected to propel the growth of the biometric vehicle access system market. The base year considered for the study is 2015, and the forecast has been provided for the period between 2016 and 2021. Potential failure pf electronic components used in biometric vehicle access systems. 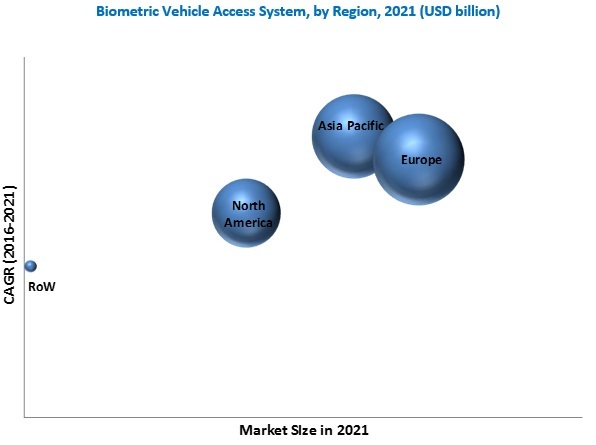 The global biometric vehicle access is a growing new market in vehicle security industry, where these systems are presently used in luxury cars and retro fit by commercial vehicles owners for security and monitoring their fleet. The biometric security systems have technological variants, and includes fingerprints, hand geometry, voice verification, and retina/ iris/ face recognition. The technology works as automated access monitoring system, which is primarily based on driver behavioral or physiological characteristics, that does verification and recognition to access the vehicle. The biometric access systems are safeguarded by number of provisions and technique’s, namely, multimodal biometric systems, template-on-token, match-on-token, data-hiding techniques, and cancellable biometrics. To define, describe, and forecast the global market for biometric vehicle access systems on the basis of authentication type, vehicle type, characteristics type and region, in terms of volume (units) and value (USD million). During this research study, major players operating in the biometric vehicle access system market in various regions have been identified, and their offerings, regional presence, and distribution channels have been analyzed through in-depth discussions. Top-down and bottom-up approaches have been used to determine the overall market size. Sizes of the other individual markets have been estimated using the percentage splits obtained through secondary sources such as Hoovers, Bloomberg BusinessWeek, and Factiva, along with primary respondents. The entire procedure includes the study of the annual and financial reports of the top market players and extensive interviews with industry experts such as CEOs, VPs, directors, and marketing executives for key insights (both qualitative and quantitative) pertaining to the market. The figure below shows the breakdown of the primaries on the basis of the company type, designation, and region considered during the research study. In October 2016, Fujitsu announced development of a new technology that would utilise machine learning and image processing to analyze surveillance camera images of traffic. The company is planning to increase the accuracy and incidents recognizable with this technology. In February 2016, EyeLock(subsidiary) has announced on a new iris identification technology to start the ignition of cars. EyeLock's technology looks at over 240 points in each eye, and the vehicle starts only after the scan is matched to the driver's iris template. In March 2016, Nuance Communications ntroduced a Dragon Drive connected car platform and Nuance Mix voice platform. This technology would provide automakers with a set of capabilities to create intelligent and conversational voice experiences for cars. What are new application areas which the biometric vehicle access system and HMI companies are exploring? The overall biometric vehicle access system is expected to grow from USD 0.44 billion in 2016 to USD 0.85 billion by 2021 at a CAGR of 14.06%. 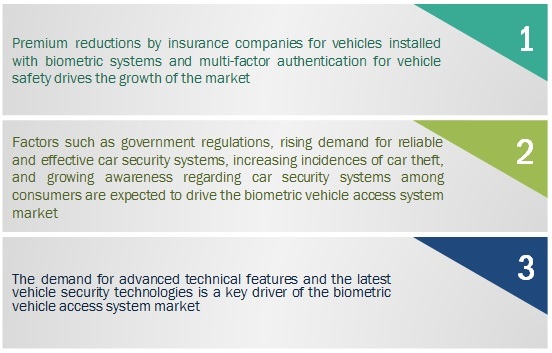 premium reductions by insurance companies for vehicles installed biometric systems, multi-factor authentication for vehicle safety and increase in legislations regarding biometric identification systems are the key factors driving the growth of this market. Biometric vehicle access systems comprise of different mechanisms that use biometric identification factors such as voice, iris, and fingerprint to unlock the vehicle. Biometric technology is an automated access monitoring system, based on behavioral or physiological characteristics, used for verification and recognition of a manual access. Some of the versions of this technology available for vehicle access are fingerprint recognition systems, iris recognition systems, and voice recognition systems. The biometric vehicle access system has been segmented, based on authentication type, into fingerprint recognition and voice recognition. The market for into voice recognition system is expected to grow at the highest CAGR between 2016 and 2021. The fingerprint recognition system is more widely present in the market as compared to voice recognition system for vehicle access. Biometric vehicle access systems are still in a growing phase. The biometric vehicle access system in APAC is expected to grow at the highest CAGR during the forecast period. APAC is the fastest-growing market for biometric vehicle access system. The rise in disposable income in APAC countries has led to the increase in the demand for vehicles and consumer appliances, which, in turn, has increased the growth of biometric vehicle access system in this region. Europe is projected to account for the largest share, in terms of value. Rising innovations and technological advancements in Europe could be a contributing factor for this growth. A device and method for accessing a vehicle with electrically activated door locks. The system uses a fingerprint sensor to detect whether the person has the right to entry. The device includes means to selectively open doors, trunks, etc., using different fingers and is used in conjunction with an existing access control and alarm system. An iris recognition system is as an automated method of biometric identification that uses mathematical pattern recognition techniques on images of one or both of the irises of an individual's eyes. Such systems can be used to unlock and start a vehicle. The system uses voice recognition software to detect whether the person has the right to entry. Voice recognition systems are also used to access other features like multimedia in the vehicle. What are the upcoming applications for biometric vehicle access? How human machine interface will affect the biometric vehicle access system market? Potential failure of electronic components used in biometric vehicle access systems is a major factor restraining the growth of the market. Biometric vehicle access systems are highly dependent on electronic components such as electrical wiring and batteries for their smooth functioning. Failure in any of these components could adversely affect the vehicle’s security system. This also results in many replacements in case of minor damage to the security system. The reliability of electronic components is extremely important in the case of complex security systems such as fingerprint recognition systems. Thus, the potential failure of electronic components can prove to be a restraint for the biometric vehicle access market. Key players in the market include Hitachi Ltd (Japan) and Fujitsu Ltd (Japan), Safran S.A (France), Synaptics Incorporated (US. ), and Nuance Communications (US). 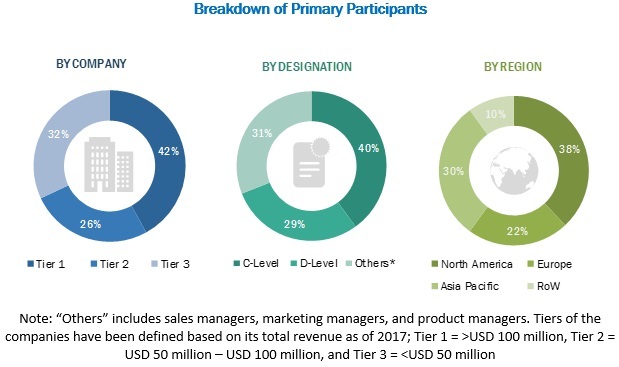 These players are increasingly undertaking new product launches, expansions to develop and introduce modern technologies and products in the market.